EVISNAM, a contactee, approached the Admin asking if he could share his "contactee ET" experiences here at Mists. To start things off the following are a few question put to him. In addition, members are also invited to ask questions. To protect his identity he requested answers to members first sent via the Admin who, on his behalf, will post them in his thread. How long have you been in contact? Thank you. Its a clear moment for me, one I wont forget, I remember being very small, about 4 years old back in 1974. I was in my room at the end of the house. My father was a caretaker for a factory and we lived on site, so we were in a fairly remote area, no neighbors for about half a kilometer. My window over-looked my fathers vegetable garden. I would often wake up at night and stare out the window, it had a ledge so I could sit in the ledge and stare. I often stared at the stars and wondered why they would twinkle, looking at them I remember (they) gave me great joy. It was impossible for me to describe how it made me feel. I would actually start to chatter my teeth when I looked at them, the feeling was intense. What was the first experience like? One night I remember looking at the garden and saw a faint blue light making its way through the tomato patch. I stared at it and the more I stared at it, the dimmer it got but if I looked away it got brighter, so I hid behind the curtain and peeked. I lost sight of it after a while and suddenly it was at my window. I couldn't help but stare at it. It was about the size of a beach ball and it lit up the room and I felt it enter the room and cradle me inside it. I felt an overwhelming sense of " home." Like it was familiar to me. I fell asleep shortly after ... I woke up in my bed the next morning, tucked in, with my teddy bear placed on the bed sitting up looking at me. When I woke up I was so full of joy remembering the blue star that came to visit me. This I believe was my first contact, at least that’s my earliest memory. I can’t really remember any of my dreams but I do remember I had a lot of flying dreams all the time. What does the group you're in contact with look like? Well at first they were just orbs, the blue light came to me a few times after the first time. It was about 6 months after the first time, but in between I started to see little elves living in my room. Never really when i was in it, just when i was walking down the hall. About 6 or 7 of them would peek from behind the door and run across the hall and they would always giggle. It was like they were playing hide and seek. So their physical form initially were Blue and sometimes purple orbs, and then in the physical I saw elve / gnome looking people about 2 to 3 foot tall. Dressed in traditional gnome clothing. The look of them as I grew older was consistent except as I matured so too did they change to more extra terrestrial looking entities. It’s a broad cross section and most of which are regarded as "evil" or "nasty" by the main stream alternative community. So I’ll delay that question till we get more into the back ground if you don't mind ? - a little bit about what you've learned about them and from them? This is a very involved question and one that would take me a long time to answer. Initially I realized I was very inquisitive. My curiosity on how everything worked became almost obsessive. It was like I had to reverse engineer everything from my mothers blender to the toilet cistern, blades of grass... I remember staring at one for about half a day watching to see if I could actually see it grow. I was making a lot of things too - painting, writing. I had many projects going at the same time around the house - in the yard - under my bed (that’s where I did classified experiments). I became delightfully obsessive and curious about everything. I remember when I was about 8 I was eyeing off chemistry sets at the local toy warehouse. I loved building models and painting them: scalextrix sets, leggo, mechano.. you name it! Then at Christmas i got my first chemistry set. Mum must have seen my letter to santa .. perhaps because I left it on her pillow and it said, " Mum please read " on the outside. So started my obsession with chemistry. So I guess in the beginning I was somehow, it’s hard to describe but , Un Locked? I remember a definite change in my behavior after that initial contact, but that’s a retrospective analysis, at the time it seemed natural. The cognitive learning didn't start till much later. The first contact I guess just made me teach myself, although I do remember playing games with the elves for a while, but they were mathematically based and used geometry. I guess drawing shapes, and the use of colors, the interaction was minimal in terms of telling me anything. I was left mainly to my own devices. I'm looking forward to read what EVISNAM has to share. TRANCOSO wrote: I'm looking forward to read what EVISNAM has to share. and has had something appear when she looked in the mirror behind her which really frightened her. Hi Evisnam, looking forward to reading more of your experiences & seeing where this goes, things that intrude into our "reality" that aren't supposed to be there are of great interest to me, and like the others I would like to offer you a warm welcome & support in going public. Add another to the list of those who can't wait to hear more Evisnam. There's nothing I enjoy more than reading another's story of their own personal truth and am grateful to you for sharing it here through Carol. I believe we each have our own very unique part/path to experience in the various realms we can be exposed to here and if more shared we might all gain a greater understanding as more and more of the various pieces of the puzzle start to fit together a little better. Maybe that's one of the main reasons we are conditioned to fear doing so. So yay to you for overcoming that to open up your heart here to us. Maybe you'll inspire others to do the same and find some comfort in what they share as well. Thank you so much ! I am in appreciation for how its been received so far, I will do my upmost to maintain its quality. The questions you pose are insightful, there was a definite "wave" or "cycle" to their involvement with me. It Seemed in retrospect they came to me every 6 to 7 years. The length of stay would depend on how aware I was or accepting of their contact. At certain phases of my life you can imagine I was sometimes less "concerned" with them and more into other things, none-the-less I could see the influences and guidance come to me through various "coincidences." The most significant stages were at ages 4, 11, 21, 29, 33 and 39 with the most significant at 39. But I’ll cover some of the intermediary years and answer some of your relevant questions that are most chronologically helpful to constructing the pieces of the puzzle. I guess I’ll start with some back ground first if thats ok? Were you ever in the military or family/parents in the military? This question is a good place to start. I have traced our family history back to about 640 AD in terms of documentation and it’s with these documents I have pieced together our family tree. I am lucky also we have some avid genealogists and found chronicle stories with their help. Within this research I have found a definite line of military from around the 1400's onward. Prior to this we were heavily into science and astronomy, while they both continued in tandem up until recently. Our Family consisted of all military men. In Europe, I guess hard to avoid from the early 1900's to the mid 60's. To give a starting point I guess I’d start with my Father was recruited into a Fascist organization under Mussolini. I can’t state the name of his group. However, it wasn't long before he formed a break away group because of his disagreement on policies they held. He told me many stories and taught me things. See my father had abilities, still to this day I can’t explain. I think war can bring these out in a person and this is the relevance of this background. My father insisted in teaching me military science and was very influential in my creative allowances. He wanted me to understand these things so i would never want them in my life. He knew I was a very gentle soul, however I was capable of things and had to have some sort of disciplinary back ground - and, I thank him for that. So I often wondered did the extreme emotional turmoil initiate or wake up dormant abilities? I would say a resounding, Yes. I think at this point it would be good to discuss this next question, while I'm open to questions from the group, this one is an interesting one. Were you ever on a craft? As i had stated before, I can’t remember early on being on craft per se, but I had a lot of dreams of flying. Flying astrally mainly, flying over my house - down to places where I went to school and played etc., etc. It wasn't till I was in my 20's that I woke up feeling I’d just been on a ship. It was like I was in a field of electricity. I was buzzing literally all over as I woke. Sometimes I saw a ship from the outside. It was the typical saucer - like a dull silver gray steel finish. It looked like a scout ship and I definitely remember one time I woke up and there was a small creature in my room. It was about 3 foot tall, purple skin, it had a very long nose and big ears - like a small elephant. It was startled when I woke up. I don't think it expected me to do so, it turned and waddled off out of the room. I had learned later that these are Doctor Scouts or Watchers. Their purpose is to examine your health, understand your biology and sometimes treat ailments if it didn't create a negative karma for them or myself. So was I ever on craft ? I’d say Yes, most certainly, but I don't have any memories of being inside them. I have memories of being in outer space and looking at large ships from obviously another ship, but not seeing its interior. Where exactly in the Galaxy or what Year it was is a mystery, but I do firmly believe there was time travel involved. I distinctly remember seeing myself and it was me but not me .. it was like another me from another dimension or time line and we (as in me and me ) were allowed to look at each other, even telepathically relay basic thoughts or feelings. I am going to go over your other questions now and formulate some answers as I go over some of my notes. I want to thank you for your warm welcome messages, i look forward to answering more shortly. This cyclical timing thing every 6-7 years sounds a bit astronomical to me, does the timing tie in with proximity to other planets one has to wonder ? "EVISNAM, a contactee, approached the Admin asking if he could share his "contactee ET" experiences here at Mists. To start things off the following are a few question put to him. In addition, members are also invited to ask questions. To protect his identity he requested answers to members first sent via the Admin who, on his behalf, will post them in his thread. I love to read this thread, thanks so much! A very smart approach to do this in this manner, Carol, thank you! existence of beings. Like the existence of elementals.... down to earth, or...... are they of that realm really? those who are counseling with ET- abductees, using regression therapy and hypnosis. a human being Thank you for passing it on, Carol, thanks for allowing me to ask questions, EVISNAM! I would like to know if the name EVISNAM does have a particular meaning. Also these beings you are in contact with do they feel like family to you ? Do you have any awareness of having come here on Earth from another area of the galaxy or do you feel you have always belonged to this place ? Regarding these cycles you mention of 6_7 years I noticed in my own life something important seems to happen every 7 or 8 years that changes the course of events . Altogether up to now these cycles have been like pointers closely related to my spiritual path. It's a bit like the days of the week. After the seventh one there is a return to first in a spiral sort of pattern. mudra wrote: Regarding these cycles you mention of 6_7 years I noticed in my own life something important seems to happen every 7 or 8 years that changes the course of events . Altogether up to now these cycles have been like pointers closely related to my spiritual path. It's a bit like the days of the week. After the seventh one there is a return to first in a spiral sort of pattern. The seven year cycle is also a biblical & Jewish phenomena. Is that why it itches each 7th year? a higher or lower frequency. According to this philosophy, our life moves in 7 year cycles corresponding with each of the 7 chakra centers located in our light body. 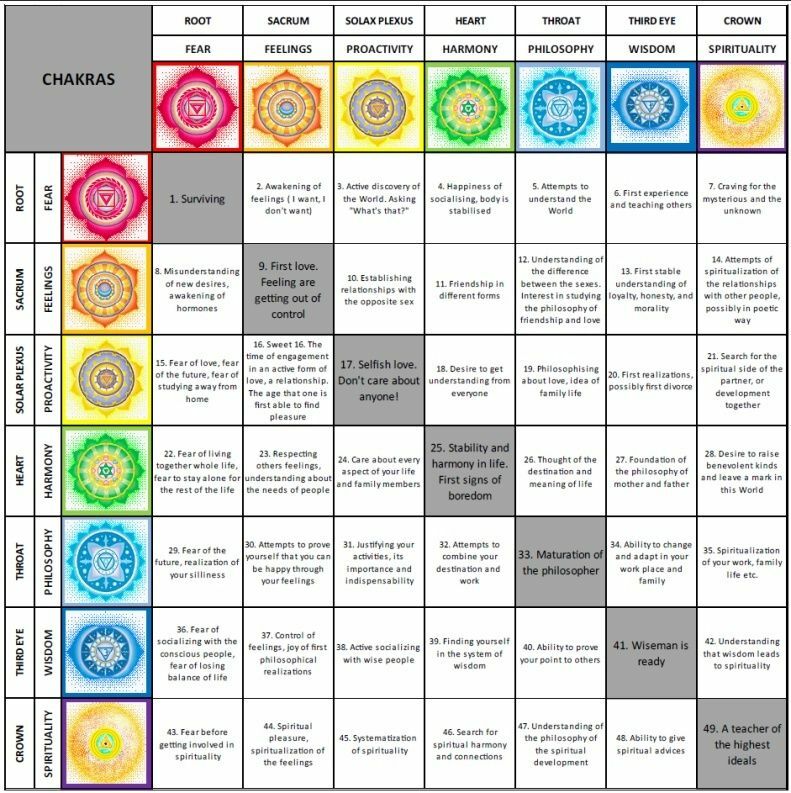 We have one dominant chakra for each cycle, corresponding to each row of the table....."
There is definetely something with the number 7. In numerology for example 7 is the number of the seeker, the searcher of truth and higher awareness. 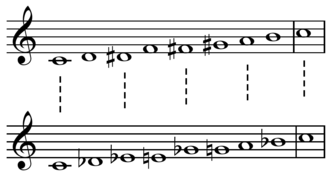 It seems like a beat which when it strikes Consciousness is invited to greater awareness. Did they teach you how to astral travel? This is a tricky question and one I”ll try to answer in 3 stages. My early involvement was really just elementary, basic building blocks to life, matter, existence etc. When I was 11 I remember going from a material phase of elemental learning to breaching the world of meditation. I remember waking up one day and feeling the distinct need to listen to modern music. Now whether the notion was given to me in sleep I don't remember, however looking back the way they works is this. Suggestion for the betterment of the individual, respecting free will and decision, the individual will make the right choice if they have freedom and courage. I cannot help but firmly believe when I made a decision to go on a whim, that I always found something invaluable along the way that has helped shape my life for the better. Yes! Taking a chance, smiling into challenges and finding the romance and enchantment of the moment! So getting back to the question, I went to find some music at an alternative music store and I selected the works of the Mannheim Steam Roller, "Fresh Aire." It had the photo of a traditional sail ship in space with the moon and stars in the back ground. That was the one! I also found a rare copy of a meditation disc, still to this day I cannot find a copy as mine was lost in time. It was from Japan and was just dreamy! So I listened to this music every night with head phones on and fell asleep to its treasure. This then ties in with BB Bagor's question too. The Third stage was when I was listening to this music I was being guided, it felt like a knowing came to me, for want of a better term.. It felt good to do what was suggested, so I went with it and the series of things I ended up doing was this. I went into a relaxed state, the music was the journey, this was to my sacred place. When I felt I was there, I gave thanks for all the things in my life. I showed appreciation for them and shared the essence of joy while in that state of mind. After that I was out cold .. I refined this as i went on in life but at an early age that was the basic "ritual" I had before going to sleep. My dreams were rich, exciting and of course I saw many things. Too many to mention here, but upon waking I would write them down in the form of poems or I would paint ... interestingly once I painted the head of a wolf with a ruffled collar and the inscription underneath was "Skat! Wolf Lives Here" and I put it on my bedroom door. The interesting part is what would motivate me to do this? ...and in the coming years a reference came back which I will cover later. So I believe this was the basics of Ritual to achieve the state necessary for astral travel. I felt I had to relax enough to enter the astral, indeed separate my physical being from the spirit centre. This was done by a series of detachments from my self. The series of meditative steps incremented the disassociation from Physical and Spiritual matter states. "If I may ask a question, I wonder if EVISNAM, by his own experiences, has found a way to discern astral-travel and astral presence from physical transportation and physical presence, while in the company of the beings he describes... "
This is a good question, the themes of this will return so ill give the basics here. It’s a very involved subject and trying to interpret what I was seeing, whether it was an apparition or real without the ability to touch it is difficult to discern. If I understand your question, the Astral was generally done while in sleep mode. To try to astral travel while awake is something that requires years of patient practice and is for adepts only. There is a definite protocol to follow and I was taught these while in my mid 20's from not only my contacts in the messages of wisdom I received during meditation, but also in the physical world when guided to study Reiki and Shamanism, in particular American Indian methods of care taking, tracking, dual placement of the self, talking to animals and plants etc., etc. The coupling of these "coincident happenings" created the information to contemplate during meditation. So long story short and leaving a lot out, which I’ll cover later on, Yes I managed to make contact at will by inducing a mental state. It used ritual which was preparation of black tea, clearing my room and my self - the more "respect" I showed for the ritual, the better the contact. I sipped the tea while contemplating the "intention" of my contact, then a series of breathing exercises induced the contact. I would go into a meditative state and in my minds eye see a spiral appear, this is a Portal. Each portal can be slightly different in appearance but in essence the same. Once the connection was made entities would appear holographically before me, around me, and I would open my eyes and see them there in the physical. This is metaholo transfer, the Holographic transfer of Matter across space time. When I was first consciously transported I was 39 years of age, it took me that long to reach the emotional maturity for them to accept I was ready to tackle conscious flight. And I must say, I was grateful they waited that long. I don't think anything could describe the sensation of leaving your body and your essence flying out to a place in space to meet with entities in their homes. I have to take a break now, I will continue this subject when I come back. I would like to ask if you are familiar with the - highly interesting and hardly ever mentioned - IARGA case, and if so what's your view on it? If not, this link will take you to the thread where you'll find links to his book and videos (interviews). This is a true story of a UFO contact from a planet called IARGA - by the alien astronauts visiting our Earth. They say that their Sun is about 10 light years as we count time from us, and that they have been observing us for some time. This story was first published in Dutch by Ankh-Hermes of Deventer, Netherlands in 1969 and has gone through 11 Editions and 40,000 hardbound copies in Dutch since then. It has been published as science fiction up to now because the publisher originally felt that this story would not sell as fact. Nevertheless it is a true account of real events and we are publishing it as such, here, for the first time, together with the very extensive follow-on data as the contacts continued right up to the present time. We have investigated this case extensively over the past 4 years and conclude that the facts do in reality verify and support the story. The witness is a very well educated and highly articulate master mechanical engineer and an architectural artist as well, a rare combination ideally suited for this contact if the alien visitors wanted their information to be understood and presented with any degree of accuracy. The witness is also a well known multinational industrialist in Europe whose real name would be immediately recognized. He is the owner of several companies doing international business. Chimpsky wrote: This cyclical timing thing every 6-7 years sounds a bit astronomical to me, does the timing tie in with proximity to other planets one has to wonder ? The seven year cycles can be explained astrologically (astronomically) via the planet Uranus’ 84 year cycle, which means it spends approximately seven years in each of the twelve Signs in one’s birth chart. Most simply put Uranus is the planet of Change (yes, with a capital 'C'), causing events which may arrive rather unexpectedly and even seemingly brutally if you’ve become too stuck in the mundane. At a personal level the planet’s influence is designed to cause you to open your mind to who you really are as a human being so as to follow the life path you were born to follow and, at a social level, revolution, as all those in a particular age group will be affected simultaneously. These events or awakenings most obviously occur when Uranus is in aspect (at the same degree) to one of your ‘personal planets’ (Sun, Moon, Mercury, Venus, or Mars) and especially when it aspects itself in Square or Opposition, the latter being between the ages of 38 to 43 I.e. what’s generally known as the ‘mid-life crisis’ lol. You can also learn the position of 'your own' Uranus by getting a birth chart drawn up for free at that site. EVISNAM's words: "If I understand your question, the Astral was generally done while in sleep mode. To try to astral travel while awake is something that requires years of patient practice and is for adepts only. There is a definite protocol to follow and I was taught these while in my mid 20's from not only my contacts in the messages of wisdom I received during meditation, but also in the physical world when guided to study Reiki and Shamanism, in particular American Indian methods of care taking, tracking, dual placement of the self, talking to animals and plants etc., etc. .......When I was first consciously transported I was 39 years of age, it took me that long to reach the emotional maturity for them to accept I was ready to tackle conscious flight. And I must say, I was grateful they waited that long. I don't think anything could describe the sensation of leaving your body and your essence flying out to a place in space to meet with entities in their homes. in any spiritual practice and my familiarity with and respect for that way of life. Thank you very much for this, it's rather timely for me personally ! What I was wondering though was if the Earth was closer to another planet or solar system at these points in time & that was why the visitations happened with the regular intervals. With reference to the latest instalment, it seems like some form of training / initiation, and has much in common with what many abductees say, not the big famous ones but the ordinary ones that don't BS, write books, make videos or become the "the flavour of the month" on the likes of PA.
A question many would wonder, are they my friends? Are they family? In order to answer this I’d like to firstly appeal to logic as this was my first feelings when contemplating a myriad of contacts. I wanted to tackle this possibility by expanding my maturity and thinking on much grander time scales than what we are generally accustomed to. Let’s think about plausible possibilities first. It’s becoming clear we weren't here for 6 thousand years and time started just before the Egyptians... if you were to read Encyclopedia Britannica, you would see people dragging 80 tonne blocks up a ramp and somehow cutting them and placing them with laser precision, while somehow aligning them to Orion perfectly without being able to see them from above! What a miracle, yes? Well, this is to illustrate we know very little about ourselves, so to err on the possible is somewhat more mature than staying with encyclopedias. With all the talk of the spiritual world we see and hear through our lives, does some of that ring true to you without the feeling of hope being the decider? Would it not then be a good idea to finally make up ones mind about God? - and just commit to that model? Understanding that it’s more plausible that we are infinite beings, that the soul is an energy centre that has achieved incredible abilities over time and in scales of time for millions, if not billions of years? When we think in these terms, weighing the evidence and emotions surrounding this subject, I’d tip the scales to the position of Yes, this is plausible. That and the next 40 years of contact are so definitely ingrained in my very being that most certainly I can say with everything inside me that YES! ... they are my family, friends, lovers, wives, husbands, daughters, fathers, mothers and everything in between! And with this being my experience, Yes we do have family, not only is it plausible but I have experienced it. Do you have any awareness of having come here on Earth from another area of the galaxy or do you feel you have always belonged to this place? Most certainly, shortly after my most significant contact when I was 39, I had a day vision, and to give some more back ground pretty much all of my contacts would happen during meditation whilst fully awake, mind you they were at night mainly, but this was a morning meditation, one of the first I’d tried to contact during the day. I went into a meditative state one day and I remember every facet of this like it was yesterday. I did a series of breathing exercises, when now i would breathe in I knew I was close to making a "jump" because the breath would "kick inside me, like an internal implosion. Then the energy buzz would hit me, and on this day I opened my eyes, I looked at my skin and it was surrounded many brilliant white orbs all around the perimeter of my body, tiny little ones smaller than a pea. It was very bright, the light was almost blinding and shapes were not as defined as they could be but i saw myself sitting in lotus position, I heard a woman chanting in my right ear and as i opened my eyes she came rushing to me and said my name, there was a Shaman to my left facing at a 60 degree angle across me, the lady that came to me was my wife, I’d obviously been in a trance for quite a while but I have the distinct feeling that’s where I am beaming in from. This vision only happened once, but that woman's voice, my wife, I hear her chant to me in my right ear every once in a while, in a language that’s completely foreign to me but feels so familiar. It is no wonder that I have never married or wanted to have children .. I feel she is there waiting for me to return from this mission, that is a most distinct feeling. It’s impossible to relay the emotion and completeness I felt when I saw her. I KNEW in that moment who she was, not only familiar to me but also very deeply part of my life as my beloved partner. Every fibre of my being was electrified by her presence, her voice, it was like for a moment in time the veil of forgetfulness was allowed to be broken, for my maturity had reached a level that could handle such an emotion. I will rest now, I must meditate and contemplate the gifts of my woman. I miss her. So their physical form initially were Blue and sometimes purple orbs, and then in the physical I saw elves / gnome looking people about 2 to 3 foot tall. Dressed in traditional gnome clothing. So initially they were (what I usually refer to as) beings from the Elemental Kingdom, or Nature Spirits, by your account. When I first started seriously meditating around five years ago, I also saw beings from this realm, mainly faeries to start, and then a larger one who said she was essentially a sylph began communicating with me (although she’s been referred to me by another as a nymph). And there have been various other types since. Oh, and I was also told that they are properly called Watchers, although I was given a different reason as to why than you were. 1. Are the Elementals shape-shifters as some claim to me to be? 2. Are there no Elementals and what we see are actually shape-shifting ETs? 3. Or are there no ETs and what we see as such are really various beings of the Elemental Kingdom? 4. Or do both exist, possibly working together at times, willingly or not? You also said that you’d rather delay on answering about the ET involvement until later after giving more background, so I’m happy to wait and just watch your story unfold if you still feel that way also. So when you’re ready Evisnam. No rush. Thank you, that last question did stir some deep emotions for me, one of the reasons that maturity is relevant in this larger world. This cyclical timing thing every 6-7 years sounds a bit astronomical to me, does the timing tie in with proximity to other planets one has to wonder? This is a very good question and possibly one I've given the least attention over time however, yes, it makes perfect sense. Our friends and family, out there, would most definitely consider astronomical cycles in what they do. Whether the alignment is particular to their cycles or whether that’s when the time comes to "check up" on their rounds .. that part is a mystery to me but we see so many examples of the number 7, the 7 major chakras, do they align with the planets? Does an energy rift make it possible for such "abilities" of contact to happen? Well my last series of contact started in 2009, actually if i was to count "messages" from beyond I’d have to say 2008. This was definitely part of the Mesoamerican Calendar System of the Mayans. 2012 was so misinterpreted as to what it was for and about, we were being contacted en masse to reconnect to our families. 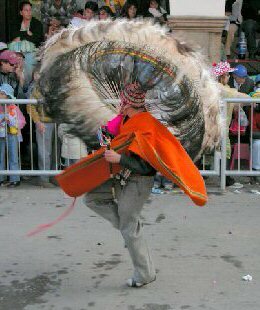 The Mayan soul group were at the end of their 13th Baktun great cycle, it was time for THEIR ascension, not ours ... On December 15, 2012 I saw the doors of their astral civilization close for business. While they were previously here to oversee our world as assistants, they were making contact to many as it was advantageous during this time to connect with family to see you through the coming years of tribulation. So to continue, what I noticed is my last period of contact lasted almost 5 years of pretty much weekly contacts and exchanges. It was an intensive period of self-reflection, contactism, learning, information exchange and going out past the vales into free space. That was forbidden to me when I was learning Shamanism, going out beyond the vales you are exposed to so many different entities and I can attest to that! It took me many years of mental and emotional preparation to properly achieve this. So getting back to your question, most definitely our "Growth Spurts" are cyclic, as there must be a rest period too to continue the natural cycle, the positive wave ascendant then the negative wave descendant .. its a cycle of energy, light and dark, yin and yang. The polar opposites of existence. It is advantageous to think of space as more of an ocean, that tides change... and certain currents of cosmic energy surround and influence us as do warm currents in rivers, tides that ebb and flow.. they are all cycles of the greater and smaller spheres of existence. BB Bagor, this would be a great book for you if you haven't already seen it. Thank You Sanicle for the article i will read over this in the coming days. Here I now refer to another question from Carol. Did you have a sense of what they wanted from you? A very good question and one I suppose on everybody's lips. What is it all about? Initially I remember as a child not really wondering about this, the adventure and intrigue consumed me. I was so focussed on creating that anything else was secondary or not even a consideration. I guess later on and in particular in the last 2 years have I felt I can safely answer that question as a retrospective of experience. I have a resounding feeling of it being a group initiative within one’s soul family. One would consider that over time they would have existed as various entities that are not like us, well at least like us in our present incarnation. I also get the feeling that inside a life we are capable of rediscovering things as though we are taking a holiday from our selves. So what do they want from me ? Well my family soul group wanted to help me retrospective of experience and still do - to give me insight and let me know I was not alone. Other entities, well definitely examine my behavior as I did invite them to exchange matter densities on numerous occasion. It would be a rarity for them to have a willing correspondent who has no fear of their agendas, and in running freely through these contact have found them intrigued by us. Why do you live on the surface of your sphere? Do you know yourself? Who you are? My appraisal of their general behavior would have to be respectful, but they do not give away much, you have to understand they have made mistakes in giving us too much and even trusting us to do the right thing, hence why it took me almost 40 years to be trusted with inter-dimentional transfers. I had the very real impression they are mopping up the mess and now they are karmically tied into our existence. I have seen them trying to gently sway us away from war or conflict, trying to educate us on better ways, but the obvious injection of technology that coincided with Roswell would see a j curve of technology that is unnatural and unfortunately, being abused. I have definitely, when in times of peril or extreme sadness, been assisted. I distinctly remember being comforted by them and on more than one occasion. I have the distinct feeling also that they want me to tell of my retrospective experience. To tell my story so that people here have a point of reference that is something to give solace and that shows we can be part of a greater galactic family. This is most assuredly part of their hopes. So I guess I am a messenger. Information helps us, feeling part of a community helps us. Seeing hope, and what I have seen, what befalls us out there is technology and wonders that would be hard to imagine. But I want you to know, it’s magnificent! What we have to look forward to when we calm ourselves from this fearsome mindset - is what’s out there. They want us to be part of their family. I get the very real feeling they are trying to see the best in us. I feel like I am reading through your Heart. You have a bridge to your soul family. My reason for delaying going into who they are and what they look like is I need to establish who I am first so you can get a feeling of who I am, that is important as when you are in a flux matter state, i.e. in meditation you enter a different set of parameters energetically and in this state different laws apply to when you are in a solid state. What is important? To know who you are. I must point out that I prefer to err on the side of caution when stating things, they are entirely real to me as Happenings and Experience and I report what I see, the element of "feelings" into the experience are important to report in a matter of fact way, not trying to color the information with too much emotion. I realize when i read these accounts myself when they get to fanciful I lose interest, so I imagine other may as well, I also realize there is a lot of fear around the subject and fear of particular types of entities or ET's if you prefer, that are now ingrained in our subconscious by default as a result of 40 years of negative propaganda. Regardless I’ll state what I have experienced none-the-less and not try to convince any one of anything but rather let you make up your own minds, I have nothing to gain either way but when reporting things that are against a global agenda it would lend to look at the manner at which these things happen and then understand that its more important to consider the small story, at least for some sort of perspective, if anything. So with that in mind I’ll happily answer the questions because I feel I have some good answers to consider, indeed interesting aspects into the mystery. I put it to you that when we are in a meditative state we are working with different intrinsic memory complex' that are running deeper within that are not noticeable when in a normal mode. In this state of accessing our memory state we have parameters that take over our normal emotional state and interact with them proportionally to emotions, fears, propensities and many other indicative markers gained over time. It is true we may well be tapping into our DNA holo memory matrix when meditating which helps create the correct frequency to see and connect with these entities, which may or may not be familiar to our ourselves when not under a vale of forgetfulness. There are so many different types of entities we can encounter, imagine 1 billion years of evolution, lives, deaths, ascensions, realms, dimensions, paramensions, galaxies, vales, hybrids, gods, masters and times it by a hundred billion! Now try to graph and name all the beings out there. In my experience I never try to pin point anything because that solidifies it in judgement and that creates a blockage imo. So what we see is any and every combination conceivable and more. Yes I have encountered human looking beings but sensing it was an Et friend masking its self and I asked it to show its face only to see a very ugly (to us) looking Et looking rather ashamed of its appearance, I actually felt its emotions whilst connected. That it knows we don't like the look of them and so not to discourage our friendship, it looks like something I prefer based on what it knows about me. I stated out loud "please do not mask yourself, I love you just the way you are!" Right at that very split second I felt a wave of emotion come over me coming from the Et that was so sincere and honest as a feeling, it was so surprised and taken back that it just looked at me and all I could feel was love. They suffer our xenophobia daily yet they are still here trying to help us evolve from being war like. That’s a definite feeling and one that has remained consistent over time. It’s one thing to have that as a one off, but remember it’s been consistent. That’s the true marker of experience and something we can draw upon as plausible. They are a combination of all dependent on our acceptance of new cultures and beings that look nothing like us. Most definitely, any combination is possible. Think in grand time scales, macro views and maturity and you will be able to get a better picture (not assuming you don't already) but generally speaking, a much clearer view of what we see is what we create in most cases. Out of interest what did the "ugly" Alien look like? Thank you for this question, I guess if I was to describe one I should describe most of them, at least the significant ones. This one in particular was small, about 3 foot tall, it was male or at least had male energy, its strange but it looked like a Pug (which is a type of dog) and this ties in with my " Skat, Wolf Lives here " painting I did when I was young, I don't know what on earth caused me to create that painting but later when I was experimenting with mirror staring, where you stare into a mirror in dim light and you see your face shape shift, I saw myself turn onto a werewolf looking man hybrid. Indeed Dogs in particular have played a major part in my connections. The head was a little larger, indeed its cranium was extended but the general feeling from the being was very gentle. Mantid (most significant in my Second Fire Connection) - Imu (type of humanoid looking reptilian based) - Lyrian - Tao Pa, interesting but they were a depository of what seemed to be Samurai Humanoids, they connected to me to relay messages to my brother mostly, perhaps his family? A series of " Gandolf " type Merlins I think were inside the Moon Base. When I encountered them it was underground in a cavern, I was asked to be transported to the Moon intentionally, so that"s what I saw when I got there amongst other things. Deities, Samsara I know for sure, had a list somewhere of at least 14 different deities I recognized. I'll see if I can dig it out for you. Alpha Draconis, only one significant meeting they presented me with a "Crystal Heart", which was handed to me from a folk lore being called Afra. An african looking man. He held the Crystal Heart to me and as I looked at it I accepted it and it was placed in my chest in a ceremony. I have seen a reptilian woman who was told to me is the soul spark mother of my genetic line, possibly in a hybrid program I was given the feeling some 3000 years ago in South Africa. She was very beautiful (for a reptilian that is) and very kind, her eyes looked so peaceful when we were allowed to meet. I think with all my encounters what is happening is a genetic revision, the very first thing I remember in my Second Fire Contact was a health check. It's important to note it is customary for all sentient and galactic beings when encountering any being is to check their health, especially if it is a lesser evolved one. This is just a standard protocal. You could imagine if you made friends with a stray dog the first thing you would do is check to see if it had fleas, etc, and if you made friends with it yould probably attempt to give it a bath and clean it up. If you are going to interact with it, it may as well be clean and comfortable. I would say it's part of a educative program to see if they can detect and heal alien (to them) ailments, it's just part of their general protocal. There are many more, The Mantid encounter I will go into great detail later on, but a brief description is they were the ones that oversaw my Second Fire initiation or "Enablement" I think I made that word up? I also curiously draw attention to the movie Enders Game which is Required viewing for all military personnel. That's a really interesting thing to note, and if you see the movie you'll see why I regard the Mantid encounter so highly. The intel I have on those guys is huge! but we can get into that later. One note to Mudra, thank you for the beautiful picture and inscription. I'm glad you sense me and we see each other, the spirit of Hon Sha Zhe Sha Nen, the Buddha in me sees the Buddha in you. 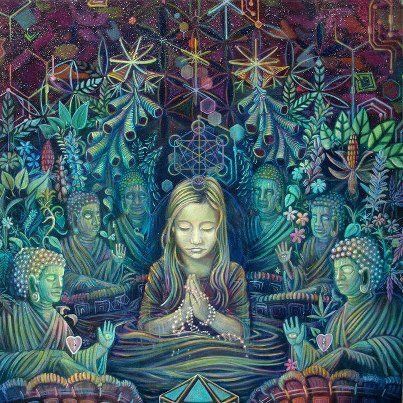 This picture says it all, a person in meditation surrounded by good spirits of the Buddha. Out of interest what did the "ugly" Alien look like ?